Last week was quite Spanish themed for us - after attending the relaunch of Pintxo, this article in the Guardian appeared the very next day, proclaiming it had discovered how to make perfect patatas bravas. Unlike the author, we've always loved patatas bravas and it's a staple when we go for tapas - and also a good indicator of the food in general. 1. Preheat the oven to 200C. Cut the chat potatoes into rough 2cm chunks. Put a roasting tray with 2 tbsp olive oil into the oven and leave to heat for 5 minutes, then take out, toss the potatoes in the hot oil, and bake for about 45 minutes until crisp and golden, making sure you toss them frequently (every 10 minutes or so). 2. Meanwhile, make the sauces. Put 2 tbsp oil into a heavy-bottomed pan on a medium heat, and cook the onion for about seven minutes until golden and soft. Put in the chilli, and cook for another couple of minutes, then add the tomatoes, sugar, salt and smoked paprika and stir well. Bring to the boil, and then turn down the heat and simmer for about 20 minutes until thick and dark. Take off the heat, add 1 tbsp sherry vinegar, and adjust the seasoning if necessary. 3. Crush a clove of garlic, and mix with the Greek yoghurt to make a cheat's allioli. 4. Take the potatoes out of the oven and sprinkle with a little salt. 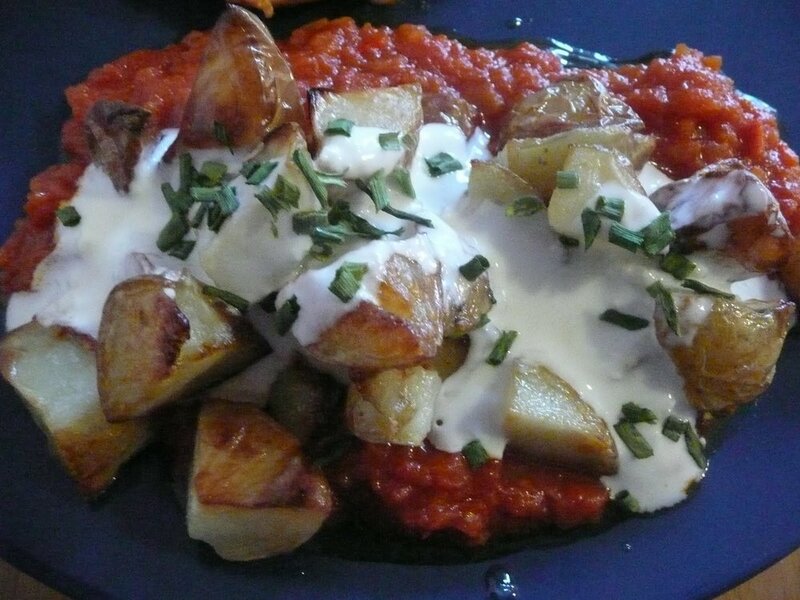 Spread the tomato sauce on to the plates, put the potatoes on top, then add a dollop of allioli and a sprinkle of chives, and serve immediately. We served the patatas bravas as a side to a marinated chicken breast. The potatoes were beautifully crispy without being oily, I think leaving the skin on the chat potatoes made them tastier. And who wants to peel a chat potato anyway? The tomato sauce was rich and decadent, and the cheats allioli added a real tang to the dish. We did try making the allioli but I didn't realise just how much olive oil was needed - we tried substituting chilli oil which gave the allioli a disgusting, burnt flavour, like eating poison. Not pleasant at all! I was glad we had some yoghurt in the fridge to substitute, and I probably preferred it to a traditional thick allioli. Please leave a comment if you decide to give it a try!